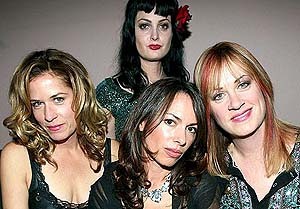 Originally "Colours," "The Supersonic Bangs" and "The Bangs", the all singing/all performing four-woman The Bangles formed in 1981 and sprung from the L.A. paisley underground scene. Later they traded their garage band roots for a slick, heavily-produced pop sound that turned them into one of the most successful chart groups of either gender during the '80s. 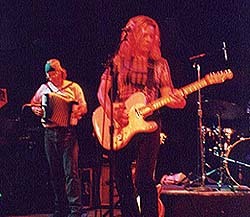 In the beginning, the group played original, '60s-based guitar rock, and were fond of covering Big Star, the Merry Go Round and Love. Sisters Debbi and Vicki Peterson, on drums and guitar respectively, and singer/guitarist Susanna Hoffs started the group when Susanna called their apartment in response to an ad placed by their ex-lead guitarist, who also happened to be their roommate. They later added Annette Zilinskas on bass. The scruffy girl group self-released the single "Getting Out of Hand" and followed it with a loose, four-song pop EP on IRS before getting signed to Columbia. All Over the Place was produced by David Kahne and released in 1984, once the band had been given an all-over clean-up. By that time, Zilinskas had left the fold to join Blood on the Saddle and former Runaway Michael Steele was added to the lineup. For the second album, 1985's Different Light, the band were aided by Prince (or "Christopher," as he was known during that phase) with his song "Manic Monday," which charted at number two and paved the way for the follow-up smash, "Walk Like an Egyptian," which went to number one and sent the album to the top of the charts. Future Black Crowes' producer George Drakoulias was enlisted as Rick Rubin's assistant and was present for their next single, a cover of Simon & Garfunkel's "Hazy Shade of Winter," from the 'Less Than Zero' soundtrack - which reached number one in 1987. At the same time, Hoffs appeared in a b-movie, 'The Allnighter,' and it garnered the band some undesirable attention, but the follow-up album, Everything, spawned another number one, "Eternal Flame," in 1988. The band packed it in due to the usual artistic differences in 1989, with Vicki Peterson going on to sing with the Continental Drifters, and also filling in for Charlotte Caffey during 1994's Go-Go's reunion tour. Hoffs recorded two solo albums since the band's breakup, 'When You're a Boy' in 1991 and a self-titled record in 1996. 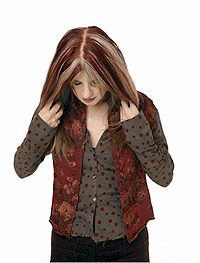 While Debbi Peterson and Steele continued to work with various alternative pop groups. The Bangles officially re-formed in the summer of 2000, announcing tour dates and followed it up with their last album of new material, 2003's Doll Revolution. Now back on tour and with a new live DVD 'Return to Bangleonia: Live in Concert' in the stores , we caught up with Vicki Peterson to ask her some tough, touch questions! At what stage did the Supersonic Bangs become The Bangles … and is it true that it was all down to a possible law suit?! Vicki Peterson "There was another band, not the Supersonic Bangs as we probably would have gotten off scot free with that one. But it was when we shortened it to The Bangs ... which was about 20 minutes later," she laughs. "We made our first single 'Getting Out Of Hand' practically to secure the name. Because we were told if you put out some kind of product under that name it's a safe bet that you can keep it." "But, as soon as that happened - and at the time we were signed to Miles Copeland's management company - this bar band from New Jersey surfaced. They then claimed that they were The Bangs and that they wanted $40,000 if we wanted to keep the name! So, I don't know if it was a law suit ... I think it was more like extortion," she laughs. "So, we said we didn't have the $40.000, added a few letters, and then called it a day." Do you think you were always meant to be in a band with your sister? "Not necessarily with my sister. I think that the idea of being in a band blossomed very, very early like around 9 or 10 years old ... and came to fruition when I was 15 when I started a band with my girlfriends. Debbi came in a couple of years later when we really needed a drummer. We had had a few boy drummers and they just never worked out," she laughs. "And she just showed this amazing ability to play pretty much whatever she picked up! And so we sat her on the drum kit and about 15 minutes later she was a drummer. Yeah, it was kind of sick, actually," she again laughs. Being that Prince wrote the smash hit ‘Manic Monday,’ you had a #2 hit with Simon and Garfunkel’s ‘Hazy Shade of Winter,’ and Liam Sternberg wrote ‘Walk Like An Egyptian,’ did it at any time rub you the wrong way that it was either covers or other people's songs that were making you famous and not your own? "It definitely rubbed me. I came to music first as more of a songwriter than a singer or a guitar player. I wrote my first song at 9 - which was reeeeaaaaally bad, as they tend to be - but it was really important to me that the band that I am in has its own voice." "So, I was sort of a stickler for a long time for the band to write within itself. And you'll notice on the first few records that's exactly what we did. And then by the time 'Different Light' came along other band members had different ideas of how to do things and so there was more collaboration with outside writers. Which is sort of a double-edged sword. I can't really complain since a lot of the success of the band and the reason why people bought our albums and our CDs, is because of the songs written by other people." "Now, having said that I have to say that we never did a song written by somebody else that I didn't like. I thought 'Manic Monday' was just a gem of a song, and did sound like something that Sue and I could have written. And 'Walk Like An Egyptian' is a completely psychedelic freak out," she laughs. "So, as much as I felt in the '90s that I would never be physically capable of ever playing that song again, as I was living in New Orleans and playing much more rootsy, folky based country kind of music, I have now come to embrace it and really enjoy playing it live." When ‘Eternal Flame’ broke everywhere at #1 surprisingly it wasn’t long after that you guys broke up. Why at that time just when you’d hit the top? "Well, around that time, towards the end of making the 'Everything' album, and after 'Eternal Flame' - and I think we even released one more single after that - it was just obvious to us and those around us that we were exhausted and that there was lot of unhappiness in the group. And mostly just a sense of we'd been dedicating our lives and every aspect of our beings to this thing called The Bangles since 1981. And, here it was 1989 and we were just exhausted." "Now I say that in retrospect for if you were having this conversation with me back in October of 1989 I would be viciously fighting to say, 'No, no, no, it's not the end,' and 'I don't want to break up the band,' and 'This is not my idea.' I was completely against it because the problems that were there we could definitely fix. That it wasn't a deadly cancer it was a virus and that it would pass," she laughs. "But then shortly thereafter I realized that it was the best thing that could have happened to any and all of us. And it really was because we needed that time to kinda figure out who we were as individuals and what else there was in life. So we all went our separate ways and experienced different things - had families and all sorts of things that didn't seem possible whilst we were Bangling." Back in 2000, did the band initially re-formed due to being inducted into the Vocal Group Hall of Fame or was that a happy coincidence? "No, that was a happy coincidence. That was absolutely like 'Woah!' It was a complete surprise to us. By 2000 we had already starting playing live shows and becoming more visible. We had been kinda working behind the scenes for a year and a half before that. We had begun tentatively writing songs together in 1998 and then recorded a track for the Austin Powers film that we did. That was our first time back together again in the studio. We then performed at the Hollywood Bowl with Sir George Martin conducting the Hollywood Bowl Orchestra - which was a highlight for me. So we'd been putting our toes in the water for a couple of years already by that time." At the time and during the recording process, what was the general feeling behind the creation of 2002’s Doll Revolution? "Well, I can only speak from my point of view and I would say that it was surprisingly easy. And part of that is because we had gone through a process before we had even gotten into the studio. We all sat in a room and did a bit of group therapy and talked to each other. 'OK, let's talk about what happened then and let's talk about how we're feeling about it now.' And it turned out that because we had more control over this recording over anything else we'd ever done - as we'd financed it ourselves - it just was a great experience." "We rented a house, set up a studio in the den, had dinner parties, had the kids over, animals ... and it was just a much more relaxed way to make a record. And it really fit in with our mode." With the official departure of Michael Steele and Abby Travis in as her replacement, how does this affect the band that their original member didn’t wish to continue? "Well, we haven't officially replaced Michael. We have worked with a series of very talented bass players ... and Abby's our most recent. I think she fits very well musically and in every other way. She's a very talented young woman. I've known her since she was 16 so we have a common history together in LA. So, I think she fits in well, but she is still a hired hand, as it were." So, that leaves the door open for Michael's return at any given point? "I would say that it's never closed, but I don't think Michael would choose to ... I think she's done. I think she's unofficially retired," she laughs. May I ask why? "You'd have to ask her," she giggles mysteriously. Right then ... I'll call her myself after this interview! "Good luck," she laughs again, this time louder. I watched the ‘Return To Bangleonia’ DVD last night and loved it … especially the acoustic videos! Have you ever considered making just the acoustic sessions the CD release? "There has been talk actually, yes. We actually considered it strongly. We're working on material for the next record now and are kind of angling towards the more harmony-driven, folksier sound in certain ways. Using more acoustic instruments. So we'll see if it comes to fruition." And what are your memories of that 2001 performance? "It was a homecoming in a lot of ways. It was the first time we'd played on the Sunset Strip in years so for a lot of the audience it was their first time seeing The Bangles in 20 odd years ... or it was their first time ever! It was just great to look out on the crowd and see faces that I hadn't seen in forever. Because a lot of the local band members came out, people who we used to play with in the '80s. So, that was very gratifying to do that in so many different ways." Were there any elements that you had to leave off the DVD for whatever reasons? "Yeah, we had to edit out a few things that our fans were upset about. But we had to take out a few things because of licensing. We do what I call 'musical non-sequetors' where we throw in a bit of another song in the middle of another song. For instance, when we do 'Walk Like An Egyptian' now we usually break into 'Mrs. Robinson' in the middle of it ... for no particular reason! We do that live, but we couldn't do that for this because of licensing." Could there ever be a Vicki Peterson solo album? "Yes, I have considered that. I tend to be a pack animal and there are definitely times when I've thought that it might be fun to branch out and try something different. That doors not closed either." Do the Continental Drifters still exist? "No, we have drifted. It's a very fragmented state. I always say it's the band that could all be 80 and we'd be playing on somebody's front porch. It could easily happen that way." Finally, is it true that after The Bangles broke up you joined Susan Cowsill and - dressed in your nightgowns - took to the stage as "The Psycho Sisters"?! "Absolutely. We've also performed in German Fireman's outfits, Union Suits ... Susan and I started writing together as soon as The Bangles broke up and we've been best friends for years. And really enjoyed singing together. So, we started The Psycho Sisters ... but we only played about five shows before we were kinda absorbed into The Continental Drifters. We talk all the time about a Psycho Sisters record, so it could still happen," she laughs for the final time.